Okay…I take it back…Birthdays ARE fun still!!! What a way to end a year! My birthday was definitely the best one I have had in a while. And I have Disney, my hubby and my mommy to thank! The day started off with AJ waking me up at the UNGODLY hour of 9:00am. I am not a morning person. He had gifts. But I grumped and said let me sleep. But I couldn’t sleep anymore. So I woke up and opened my presents! I love opening presents– that never gets old! Then we discussed whether or not we should go to Disneyland. We wanted too, but both of us have been feeling kind of sickie-poo lately. I really wanted to go to Disneyland but I didn’t want to feel miserable. Then I thought maybe some sustenance would help! So my dear sweet mom took us for breakfast at Dinah’s. Have y’all ever been there? It’s DELISH. Well, if you like diner food that is and can enjoy a delicious pancake. Which I can…oh I really can! Breakfast was just the key to give us the energy boost we needed to attempt the day. By the time we got to Disneyland and I breathed that Disney air I was feeling pretty dang good! The minute we walked through those gates every feeling I had felt as a kid at Disneyland came back to me. It was Joyous! And because they gave a “Its My Birthday” button to wear, everywhere I went kind folks wished me “happy birthday!” I was loving it! We stayed till midnight and had so much fun. That was my first time at Disneyland with AJ, so it was pretty special. I loved seeing his excitement too. Luckily though, it won’t be our last visit. We got annual passes so we will be back. And now maybe I can even do an engagement shoot there should any brides wish!!! Okay! You want pictures! We only took the point and shoot cause really I didn’t wanna worry about my pro camera while I was acting a fool at Disneyland. Sometimes in my personal life I just want my point shoot with me. So these are some pics..straight of of the camera…You can see me sportin’ my birthday button! s h e r r y - AHHH! I want to go to Disneyland for my birthday! 🙂 Did they give you a special pin? Sean - Aww, I’m sorry I missed your birthday! Happy belated you! Disneyland sounds like it was so much fun, I’m kind of jealous! Totally hear you in 0900a being ungodly. EW. cindee bae - Looks like you had fun, I live 30 mins. away but haven’t been there for 5+ years.. Should make a trip soon..
ashleightaylorphotography - thanks!!!! it was such a blast. seriously haven’t had that much fun in a long time!!! im sooo stoked about the annual pass too! hope we get to go lots and lots this year! Adrienne Gunde - Happy belated! Looks like you had a wonderful time! My bf & I just went to Disneyland and I TOTALLY shed a tear or two during the fireworks/snow portion. 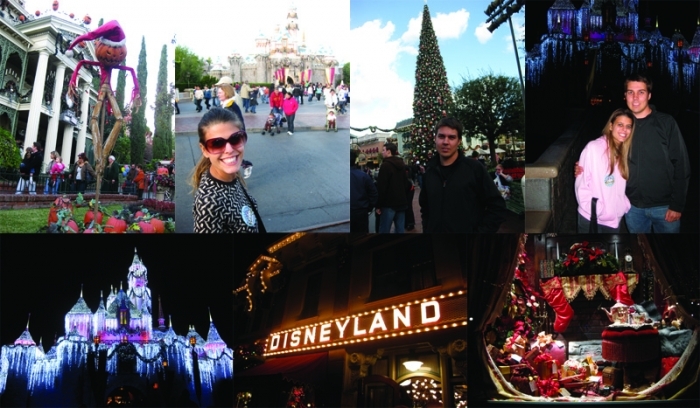 Disneyland during the holidays is the best!! Nicole Glenn - EEK! I loooovvvveee Disneyland! I went for my birthday as well! Glad you guys had a fabulous time and I am so jealous of your annual pass. 🙂 Happy belated birthday and merry Christmas!! Tonya Peterson - This is my first time to your blog and let me say you are adorable. Disneyland is a total blast and I am way jealous! Great shots on your blog too! Thomas Frank - Happy Belated Birthday Ashleigh! I’ve been meaning to send you a note. How fun I haven’t been to Disneyland in years let alone with Heather. Love your Bday button. Tell AJ I said hello. Have a Happy New Years!